The XTZ 99.25 LCR is a further development of the immensly popular previous model 99.26 Mk II. The new version has got updated crossover filters, optimized for the best possible performance in terms of phase linearity and frequency response. Just like its predecessor, the new version is equipped with SEAS Excel High End drivers, providing an absolutely clean and transparent sound. 60 years of experience supports this driver. The 99.25 LCR also features a ribbon tweeter to ensure a superior transient response and very flat frequency response. For the 99.25 LCR , XTZ have carefully selected the components. The goal was to offer a top end stand speaker with a minimum of colouring, and with a finish normally not found in this price range. The 99.25 is a monitor speaker in the XTZ 99-series, and can be used as front speaker on a stand or satellite. It can also be used together with a subwoofer. The tweeter can be turned manually for both horizontal and vertical mounting. The logo too on the front can be adjusted to suit. Higher quality MDF has been utlised so as to ensure less tolerance. 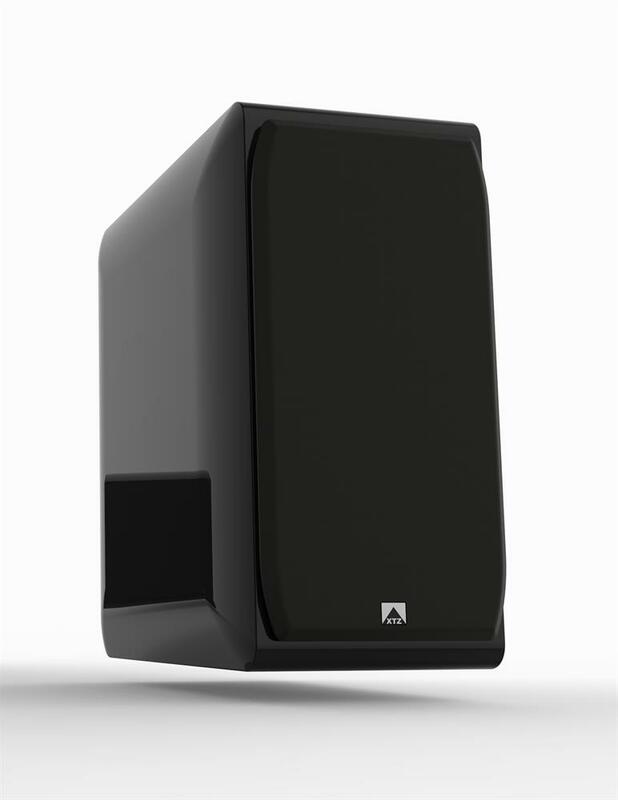 XTZ have selected a ribbon tweeter with superior transient response and a very flat frequency response. Ribbon tweeters are frequently used in high end speakers. The ribbon cone is super light and only 18 microns thin. It is a rosin-aluminium-rosin sandwich construction that has been hardened at 320 degrees celsius. The magnet system is a two row highly efficient neodynium construction in a moulded chassis of ceramical carbon steel. Fishbone shaped contactors in aluminium provide a low connection resistance and good heat dissipation. The driver has a high power capacity and handles frequencies up to 40000 Hz which makes it DVD-Audio and SACD-ready. After evaluating a large number of drivers from different manufacturers XTZ selected one from Seas, a company that has a solid reputation in the area of high quality speaker drivers. You can find Seas drivers in many High End speakers, even with 6 figure price tags. With 60 years of experience, they have cutting edge knowledge that puts most of the competition behind. For the woofer/midrange XTZ decided on a 6,5" magnesium driver from the Seas Excel series that have extreme performance. We claim that finding a better 6,5" driver on the market is a very difficult task. The surface treated magnesium cone is extremely light but still extremely stiff and effectively reduces resonances. The moulded metal basket is a "high flow" type that is acoustically transparent and has high precision since the basket is shaped exactly due to the moulding process. This makes sure that the basket is very stable and efficiently reduces resonances. The basket is absolutely non-magnetic, which contributes to a higher efficiency of the driver. Heavy copper rings mounted above and below the T-shaped pole piece reduce non linear and modulation distortion and increase the overload margin. The copper plating of the top and bottom plates along with a solid copper phase plug improves the heat conduction and thus contributes to the high power durability. Goldplated terminals reduce contact resistance and serve as anti-corrosion. Large windows in the basket both above and below the spider reduces sound reflections, air flow noise and cavity resonances. The crossover is an advanced 2 1/2 way Linkwitz/Riley type, with 12/18 dB/oct slope for the midrange and tweeter. This offers a minimum of phase shiftings and good transient response. The filter uses MOX resistors, air wound coils and high quality capacitors. There are tuning options included to enable you to adjust the tweeter level to match your listening room and preferences. The bi-wiring connectors are goldplated and you can connect to the amplifier with double cables (bi-wiring), or connect to two amplifiers (bi-amping) for further improving the sound. This would need active filters. By using the supplied bass reflex plugs, it is possible to mechanically alter the lower boundary frequency on XTZ 99.26. This makes it possible to drastically alter the sound character of the speaker. You can choose from eight different sound shapes in the bass range by using the bass plugs. With the plugs inserted the speaker operates as a sealed construction. When the plugs are out it is a bass reflex setup. This option lets you ajust the character of the speaker to suit the room, other equipment and your personal taste.